Congratulations, Madam President! 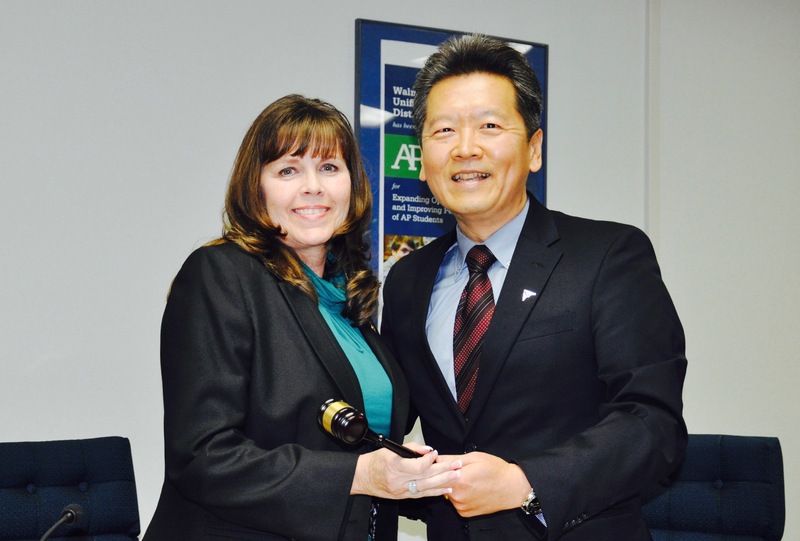 WVUSD Board President Dr. Tony Torng passes the gavel to Cindy Ruiz who was elected 2018 Board President during the December 13 meeting. 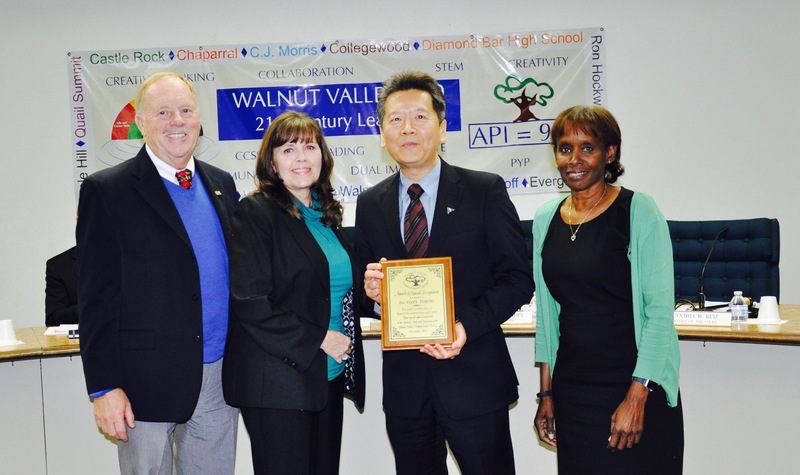 WALNUT–The Walnut Valley Unified School District (WVUSD) Board of Trustees elected Cindy Ruiz as president, Larry Redinger as vice president, and Helen Hall as clerk during the annual reorganization meeting on December 13. These roles are one-year terms and effective immediately. Trustee Dr. Tony Torng was honored with an engraved plaque for his outstanding leadership as the 2017 Board president. “I’d like to thank Dr. Torng for his wonderful service this past year as president and welcome back Mrs. Cindy Ruiz as president. We’re looking forward to a great next year!” said Superintendent Dr. Robert Taylor. Outgoing Board President Dr. Tony Torng is honored during the annual reorganization meeting on December 13. Shown with trustees Larry Redinger, Cindy Ruiz, and Helen Hall. The WVUSD Board of Trustees usually meet the first and third Wednesday of each month at 7 p.m. at the District Education Center Board Room located at 880 S. Lemon Avenue in Walnut. Please visit the website at www.wvusd.k12.ca.us or call the District Office at (909) 595-1261 to confirm exact dates, times, and location for meetings.